Cahill-IP, PLLC Founder Amy Sullivan Cahill talks about how podcasts helped her gain the courage to start her own firm. Starting a new practice can be intimidating and many attorneys never take the leap towards owning their own firm. In this episode of New Solo, host Adriana Linares talks with Cahill-IP, PLLC Founder Amy Sullivan Cahill about her journey and how podcasts helped her gain the courage to start her own firm. Amy Cahill is founder of Cahill-IP, a law firm based out of Louisville, KY. Her practice focuses on trademark and copyright litigation, advertising review, trademark prosecution, trade secret counseling and litigation, licensing, and transactional matters. Special thanks to our sponsors, Solo Practice University, Clio, and Answer1. Intro: So you are an attorney and you have decided to go out on your own, now what? You need to plan and you are not alone. Join expert host Adriana Linares and her distinguished guests on New Solo. Tune into the lively conversation as they share insights and information about how to successfully run your law firm, here on Legal Talk Network. Adriana Linares: Hello and welcome to New Solo on Legal Talk Network. I am Adriana Linares, a legal technology trainer and consultant. I help lawyers and law firms use technology better. Before we get started with today’s interview, I want to make sure and thank our sponsors, answer1, Clio and Solo Practice University. Answer1 is a leading virtual receptionist and answering service provider for lawyers. You can find out more by giving them a call at 1-800 answer1 or online at HYPERLINK “http://www.answer1.com” www.answer1.com and that’s answer1.com. Clio is the world’s leading cloud-based legal practice management software. Thousands of lawyers and legal professionals trust Clio to help grow and simplify their practices. Learn more at clio.com and that’s clio.com. Solo Practice University at solopracticeuniversity.com, a great resource for solos, both old to new to learn how to run their practices better. Today my guest is Amy Cahill. She is the owner of Cahill IP in Louisville, Kentucky and I want to start by thanking Amy for finding a few minutes to be on the show today. Hi Amy. Amy Cahill: Hi, good morning. Adriana Linares: Amy it’s so nice to have time to chat with you one-on-one because when you and I met it was busy, they were fleeting moments but you and I both were at the Clio Conference 2016. Amy Cahill: Yes I had listened to I think every podcast you have recorded and when someone told me that you were in the same room which was sort of a big room full of a lot of people, I was so excited to see you in person and then you were nice enough to take time to talk to me and it was like meeting a celebrity for me. Adriana Linares: You know I have to say it is so funny. I always think well nobody must listen to this little podcast and all the time and I travel a lot and I mean I get in front of groups and I speak a lot, I am the chair ABA TECHSHOW. So yes I sort of end up in front of a lot of lawyers so it’s funny that our dear friend Nehal from Alt Legal who I adore came up to me and said, Adriana there is a lawyer here that would really like to meet you and I said great. I love meeting lawyers and he introduced us and you were so sweet and so nice that I think I mean it really took everything I had inside my little body to not actually cry because you had got on your own and you had thanked me for New Solo which I mean you’re welcome but really it’s all because of the amazing guests that we have and everyone who is so willing, all the other lawyers that are willing to share their information and it was just so cool and it was so nice and I really want to thank you for being so enthusiastic and for actually taking the dive so that’s what we’re going to talk about today. We’re going to talk about how you actually went out on your own because when we met I thought no other lawyers have to hear this story because you’re the one who said I didn’t think I could do it, your podcast helped, I’m sure you had other sources that helped you too. So why don’t we back up just a little bit and give our listeners a little bit of background about where you came from, where you started and when you started thinking about going on your own. Amy Cahill: Sure. So I’ve been a lawyer for about 20 years, a little bit longer than 20 years, and exclusively an intellectual property lawyer for the past 16 years. Most of those years I was at a large law firm actually two large law firms, one in the DC area. I graduated from the LLM program at George Washington University in DC and took my first true IP job there and Alexandria at a great firm, a large boutique IP firm and after six years there moved back to my hometown which is Louisville, Kentucky and worked here and was a partner at a large regional law firm here in town and I worked there for about eight years. I’ve been out on my own for about one year now as Cahill IP, practicing intellectual property and advertising law, about half litigation and about half not litigation which in IP world means a lot of counseling, registration work, licensing work. That’s my background. Adriana Linares: So background on your background I guess or maybe more about background on the demographics around there, I would not have thought that Louisville, Kentucky is a hotspot for a lot of IP work and you must have not only been busy enough in a bigger law firm but also recognize the need for services like yours to have gone out on your own. So what’s going on in Louisville? Amy Cahill: Well probably around the time I decided I wanted to come back to Louisville for all the reasons people would want to come back to Louisville from a place like DC, the intellectual property law scene I think was on the rise. The larger firms here had started acquiring the small boutique IP firms here and that was the case with the firm that I joined. It was a large general service firm with a very good reputation and a regional footprint that had identified IP as a growing area of the law. These large law firms bring in consultants to talk to them about what’s growing, what’s not growing and had acquired a small firm here in town. That firm had probably been around for almost 20 years and was maybe the only true IP firm in town, acquired that whole practice and then started to try and grow it. IP law is a little bit different than some areas of law and that you can have more of a national practice because the US Patent and Trademark Office does not require admission to a particular state bar for practice so that helps expand the client base and then all litigation, I should say 90% of litigation and the IP space is in federal court and of course the barriers to practice in federal court are different than practice in state courts. So I think that those two things helped but when I moved to Louisville there were really only two large firms in town who would have had the right kind of fit and I just called both and said I’m coming back to town, I’d like to talk to you and ended up with one of those positions. Adriana Linares: That’s cool. And then what was the impetus or the series of things that made you start thinking about going on your own? Amy Cahill: Well I want to say that the firm I came from was an excellent firm with excellent lawyers and a great training ground with very well thought of professionals and I have to add that there were in my view not enough women in leadership positions at that firm as there are not in many firms of that size particularly in this region of the country and I felt like I was spending a lot of time trying to meet the firm requirements that were being set by non women partners and that more and more that wasn’t what I enjoyed about being a lawyer. I think after a long period of time practicing in an area you do have some confidence that you can offer the same level of service, the same expertise without the parts that you really don’t enjoy and maybe you get to a point in life at certain age or certain mindset where you think you know it’s now or never like I’ve got to take charge how I want my life to look and it was sort of one of those epiphanies I think it certainly didn’t happen overnight. When you start a large law firm there’s generally go right out of Law School, a lot of women there with you starting out. So this is the age-old story, but if they try to bring in 50-50 into the incoming classes and over the years of course you’re almost all of your friends end up leaving and I told all the women who came in behind me and there were a lot of women through the years who would say how did you do it, basically how did you keep going and I would say never quit on a bad day, don’t quit on a bad week, don’t quit during a bad month. Amy Cahill: Right, it’s really something I think happens to a lot of women for reasons that I understand completely but I tried to think I would re-evaluate in six months and I would re-evaluate in a year if I still felt the same way that I was feeling almost on a daily basis which is this is not working for me and when I got to the end of that year and I felt like it really had been a full year of me thinking yes, I still feel like this is not right for me and moving forward with the rest of my career then I thought okay what are the alternatives? I didn’t just think about going out on my own, I thought about other alternatives but this one started to emerge as the one that would address most of my objections to the large firm because it allowed me to continue doing what I like to do, practicing law, I enjoyed the clients, I was hoping I could continue to work for some of those clients at least some of them and it seemed like the more I researched the market that it was a platform that was likely to be successful although like all new solos I wasn’t sure it would be successful but it sure felt like there is enough out there that it made some sense. Adriana Linares: So when you talk about doing research as far as the market, the marketplace, the opportunities, where did you turn it and where did you look? Like if a young lawyer can up to you today and said I hear what you’re saying and I totally believe you but I still want to do some of my own research, what did you do specifically in getting to that place, who did you talk to, what did you read, where did you go? Amy Cahill: And I promise your listeners that this is not a paid advertisement but I truly did start with your with your podcast and I would listen to your podcast. Adriana Linares: I promise them too. No that’s cool. Amy Cahill: Your podcast and the lawyer’s podcasts and I would listen in my car on the way to work. I would listen in my car on the way home from work because that was the time that I had to devote to research. And I thought the lawyers gave me a broad view of what was going on in the marketplace among lawyers and law firms and I got my first introduction to things like Clio, which was — I had never heard of Clio, I didn’t know that practice management software existed in the Cloud. Amy Cahill: It sounds like an advertisement too, but it is a game-changer for somebody who is thinking of going out on their own. Alt Legal, as you mentioned, our friend Nehal who has developed a Trademark Docketing System, cloud-based docketing system that was also a pay per use or pay-as-you-go product. There were other software products I heard about. I used Fastcase for research, it has a bar benefit. Amy Cahill: I am member of five different bars and two of them offer Fastcase as a benefit. So I started thinking okay, from the mechanical side of things I think this is doable. I understand now how we can make this work from a sort of nuts-and-bolts perspective, because at large firms you really don’t see the back end at all. You don’t understand how anything is even getting on the docket. So that’s scary for lawyers. Adriana Linares: And they tell you that you don’t have to, right? I started my career as a Technology Trainer and IT person in two of Florida’s largest law firms and it’s really funny how very different it is. So they generally do not use practice management programs. They will have the document management system but they don’t have practice management which is weird, because you think the bigger the firm the more they would need it. But too you and I could not have had the type of conversation 10 years ago that we would have today about going on your own, because as you mentioned the mechanics are a lot easier. 10 years ago I would have to tell a solo it was going to cost them $5,000 or $8,000, maybe even $10,000 in initial capital to even get started to go out on their own. And now because of the programs that you mentioned that are cloud-based and affordable, I think that’s the key word, you start adding them up and you think well, for this, this and this total you’re looking at maybe a couple hundred dollars a month total for all these programs. And back in the day 10 years ago it would have been thousands of dollars to get started. So that’s really exciting that you figured it out. Amy Cahill: And I had to figure it out to gain the confidence to think that this is a possibility, and you’re absolutely right, from everything I listen to it was something sort of in the last seven years between the time I started listening, going backward seven years where that really start to become a reality and I remember being on the phone with Nehal, I remember this so well. In my last firm they had a docketing system. Of course, it was one of the big docketing systems, I am sure it was very expensive. It took us a year to implement this docketing system. We are changing from another big docketing system, one year to implement it. I am sure it was a six-figure solution, and it was terrible. It was terrible. And when a client would call and ask for a chart of all of their trademark holdings and I would go to the paralegal and say can we prepare a chart of the trademark holdings, it was something that you wouldn’t even recognize as a trademark chart. It just was not good for me in my practice. Maybe it was serving some other person well who is doing something completely differently, because there is firm-wide docketing system. But when I saw what Nehal could do for something very affordable that was 500% better than anything I had ever seen out of the big docketing system. He understood it and he got it. It was sort of about attorney friendly, client friendly, IP friendly product that I just thought to myself where have you been, like why have you not been –these big firms providing the solution all along. So things like that, but it was a game changer, and when he said I can import all of your marks in here today. Amy Cahill: But I can do it as soon as we hang up. I can send it to you in one hour with a full chart. These things were amazing to me that the horse power was out there and somebody had already thought it through and developed it and that somebody like me could afford it, right out of the gate on day one. I think I did a calculation at one point including all of my overhead and rent and if I could bill 10 hours right and I have heard things like this on your firm, but that’s exactly what you do, how many hours would I have to bill to cover my expenses, 10 hours a month, I thought I can bill 10 hours a month I feel fairly confident from day one. So, you are right, the technology is just a huge piece of it. Adriana Linares: Yeah. It’s definitely in a really good place and I think these startups, these brilliant lawyers and developers coming together to create these tools it just has changed everything. So it makes me so happy to hear that you are powered by small companies that built themselves from the ground up looking to fill a hole in the legal profession and that it is totally working for you. So before we move on to our next segment though, because I still have a few more questions to ask you, we’re going to take a quick break to hear a message from our great sponsors. Is your firm experiencing missed calls, empty voicemail boxes and potential clients you’ll never hear from again, enter answer 1 Virtual Receptionist. They are more than just an answering service. Answer 1 is available 24/7. They can even schedule appointments, respond to emails and agree with Clio and much more. Answer 1 helps make sure your clients have the experience they deserve. Give them a call at 1-800 answer 1 or visit them at HYPERLINK “http://www.answer1.com/podcast”answer1.com/podcast for a special offer. Clio is an invaluable software solution for law firms of all sizes, handling all the demands of your growing practice from a single cloud-based platform. Clio enhances your firm with features such as matter and document management, time tracking, and even billing. Clio is an effortless tool that helps lawyers focus on what they do best, practice law. Learn more at HYPERLINK “http://www.clio.com/”clio.com. Ready to create and build your own solo or small firm practice, need a nuts and bolts education on the 360 degree experience of starting a business, there is only one online destination dedicated to helping you achieve your goals, Solo Practice University, the only online educational and professional networking community dedicated to lawyers and law students who want to go into practice for themselves, more than 1,000 classes, 58 faculty and mentors. What are you waiting for, check up HYPERLINK “http://www.solopracticeuniversity.com/”solopracticeuniversity.com today. Adriana Linares: All right, welcome back to New Solo. I am Adriana Linares, and with me today is Amy Cahill. She is an IP attorney based out of Louisville with a national practice who powers her law firm through small but powerful legal technology startups that make her efficient and productive and those tools are affordable which is one of my favorite things to make sure New Solos hear about and believe and welcome back Amy, thank you so much for taking time again to join us today. We left off sort of talking about those very things that — there are these tools that are able to serve you and help you, and you went out on your own about a year ago. I was looking at your website a few minutes ago and you’ve got two other attorneys, is that right? Tell me a little bit about how you acquired, grew, attach those lawyers. Tell our listeners a little bit how you went from — I am going to go on my own. I figured out how the mechanics work. I think I got this to adding a few more attorneys to your law firm? Amy Cahill: Yeah, we now have three other women attorneys, so we are a total of four women attorneys here. Amy Cahill: And I have to be honest when I left the large firm to start my own practice, I didn’t have a growth plan. I thought I am going to do it myself, it’s going to be very simple. I have dreams of sitting in an office where things are perfectly quiet and nobody knocked on the door and there were no meetings to attend and that was fine. That was going to be fine with me, but then the work came and there was a lot of work and I was working a lot. And I was at a Preschool Fall Festival and ran into this lawyer who had been at the large firm several years ago and had left when her first child was born and had been out of practice for about three years and I said to her, Christina have you ever thought about going back to work and she said I was just starting to think about that, and I said come talk to me. So that was sort of fortuitous. She was an IP lawyer at my former firm and we had practiced together in the past, although she wasn’t practicing there at the time. I ran into it, I want to make that clear, but that was great, wonderful fit for me. Another woman here from a large firm contacted me several times about talking to me about joining, that’s Michelle Coughlin, and I tried to set out all of the things that you might not like about a small firm that she would have in a large firm, and she seemed to have the same mindset that I did which was what I am getting into, what I am getting is so valuable to me that I can live without all that other stuff to that. That was a good fit as well. And then my best friend for years and years and years recently decided to join too. So we’re all women shop here. We have one admin who also serves as a paralegal and we just have a great time. Adriana Linares: So I love to listen all these things, and is everyone, are all the lawyers, mothers who are also trying to figure out how to balance work and life and just have a career that you all love that then of course pay all the attention to a family that it needs? Amy Cahill: Yes, we all are mothers. All the attorneys here were at different stages of being mothers. We have different numbers of children, different ages, but I think we all bring our experience of being a woman on this planet to the practice and that we’ve loved — we have loved that, so there is a lot of we can imagine — a lot of flexibility, a lot of camaraderie, a lot of husband bashing, I am kidding about that. Adriana Linares: I am sure – I am sure all the husbands are very supportive and very important to the success of everyone’s career. Amy Cahill: That’s absolutely right. That’s absolutely right. Amy Cahill: We couldn’t have made it this far without them. Adriana Linares: Or wives, maybe there is husbands and wives, I don’t know, we can’t put everything into just a box anymore. Adriana Linares: So I love that. We don’t talk too much about that on New Solo because I feel like I’m usually just diving it, how did you do, what kind of technology you are using but I’m a woman too and I have work balance and all of my great friends do, my lawyer friends, even I have several friends, three of them that I can think of off the top of my head who are actually single dads raising their daughters. Coincidentally, they’re all dads raising daughters. And the importance to them of having that work-life balance is really important. So what I love about what you’re telling me is you didn’t set out necessarily to create this firm that offers that. You created this firm so that you could have that and then through happen circumstance and networking and just being out in the community that you found other women, who are also looking for that and now you together have this firm that understands our professions are awesome, we love what we do, technology is helpful. I think I guess what I’m always trying to remind lawyers is, again, ten years ago we couldn’t have these conversations. They were very different because the technology was harder, it was more expensive. So if everyone in your firm was in the room and we turned around and said so how important is technology and what you’ve sort of baked into your practice and your professional lives and the ability to have some flexibility with your personal lives? How important has technology been to that? What would these all say? What would the answer be? Amy Cahill: In this firm, I think that technology has been important in increasing efficiency and allowing time in and out of the office to be managed in a way that suits individual lifestyles and schedules. I think as we talked about before it also allows you to manage the overhead so that you can be the type of attorney that you want to be, which is to be a highly responsive, adaptable, lean, price-conscious service provider and I think we did a good job with that. I think our clients would say that we follow through on all of those hopes for legal services. Adriana Linares: I think that’s great. And how did you decide are you doing flat rate hourly or I’m trying to think of the questions that if I was a lawyer listening to this, I would be wondering how did you decide what to do? Amy Cahill: Yeah. I was so excited to have some flexibility around what I wanted to do because I’ve had clients for a long time and I realized what it was that they needed. It didn’t always fit the large firm format. So the large firm you really can’t open a file unless there’s a minimum, right, maybe it’s $5,000, you’re going to bill on that matter or elsewhere just don’t bother because the paperwork is just so expensive when it’s got to get you set up in the docket, and all of those things. So we don’t have that problem. If someone wants to call me with a one-off, we can handle that very quickly. We have a very lean conflict system. We are paperless. We have document management, cloud-based document management system. I can do it all. I could probably do it all from my phone, my eyes aren’t really good enough, that’s the truth. To get a new client and then go and get them set up, yeah, I am 47 and my eyes aren’t what they used to be. But I know it’s possible. So I decided I was going to sort of tailor things to different clients based on what I knew their needs to be. So we do have subscription-based clients, clients who pay a certain amount each month, they can call me as much as they want. Amy Cahill: Yeah, I think that’s been great for certain clients. I knew which clients that wouldn’t work well for me or for them but we have a lot of flat rate services and a lot of IP firms do offer certain flat-rate services. We have traditional hourly billing but also have the ability I think to just say this is how much I think this is going to cost me, this whole project you’ve described. And so let’s talk about doing it for this price. And I feel confident that that’s a real price because I’ve got the experience, I know the client and it’s just the flexibility that it gives you to price things in a way that works for both sides. It’s very refreshing. Adriana Linares: Oh I totally agree. And I say to lawyers all the time, mostly when they’ve had a few years behind them and they go, I wouldn’t know what to charge, I think no, you really do. Somewhere in there, there’s a number or there’s a figure, you’re just afraid to actually say it out loud, which I think is such a funny thing that happens to us. Once you’ve got a place to start, it’s a lot easier to teeter up and down and then I think slowly what lawyers, especially with the flat rate find is that as they have the confidence to say those figures out loud and know that the value is there. There will be few times that a client will turn around and say that’s too much; and if they do, you just adjust it a little bit because you have the right and the confidence and the ability to do that and I think that’s what is hard sometimes for lawyers to do. Adriana Linares: Isn’t that amazing. Amy Cahill: That will change. I mean eventually we will run into somebody who is upset about bill or charge but it is amazing to me to feel like I have obviously provided value at a fair price to these clients and that they feel the same way. So you’re right, don’t be afraid to state what you think your value is because you’re probably right. Adriana Linares: And I hate to even pull the woman card but I’m just going to say it out loud, I think it’s even harder for us sometimes as women to say and I don’t know what it is about us. I think there’s a level of shyness in saying out loud, here’s the value I can provide you but I just want to encourage every single lawyer regardless of your gender but especially women to just say out loud, here’s what I can offer and here’s the value and if in the end, you’re not happy, we’re going to talk about it till you are and I just think that’s a hard thing for us to say but I love encouraging women. And again any lawyer women to do that and then hearing like you just said no, it works out. We have amazing value at this firm and our clients have always been happy. I love hearing that. So before I let you go because we’ve been yapping for a while now, what are the two or three main things you have found yourself saying over this year, you’re right, it’s not very long, you’ve got a four-person firm, it’s obviously busy, you’re efficient, you’re mobile, you can all probably work from anywhere, you can take your vacations, you can take your family time. Oh wait. Wait. Wait. I am going to give you a minute to think about that. Tell me before we hung up about was it Mom, Esq. Amy Cahill: — Mother’s Esq. is the group and it’s a group that was founded by one of my colleagues here at the firm, Michelle Coughlin and it’s gotten recognized now by the ABA and it’s just an association with state affiliations to support women in the legal practice. And I just think it’s an issue that’s gotten attention over the last 20 years but just not a whole lot of progress has been made and people are now ready to focus on it again, maybe in a new way and I wanted to mention it there because she’s done such a great job and just absolutely starting it from nothing. Adriana Linares: No, I think that’s great and I think everyone who’s listening to this should definitely log on and take a look and learn more and contribute in any way that’s possible. And now I’m going to go back and ask you the question I started with, which was what are the two or three tips that you hear yourself either repeating when you’re talking to possible new solos or new lawyers or young lawyers or the things that you just keep saying to yourself, these were the three smartest things I did or two, there’s a lot of pressure. Amy Cahill: Yeah, three is a lot. So they’re probably just same things, the same things that I tell my own children that’s the truth. I have four small children and what I tell them all the time is, when you’re looking at two alternatives, be brave. Take the harder choice. And when you’re really afraid of something then do it twice as fast, right, we don’t run away, we look at right in the eye and we face our fear. So if it’s that you think I think I would like to do it, I am not sure and that’s the braver or the harder choice, take that choice. I really think that’s the way to live. So that’s sort of my own credo. And I think the second piece is remember all the people, who are involved and that includes your clients who have shown you such loyalty in following you because when I left I was just one person in one office and try to return that loyalty. And it’s same with your employees and your colleagues at the firm. Always, I try to air on the side of their favor; in other words, if there’s ever a question on whether or not, I owe you 15 more dollars for lunch then let’s not even talk about it. Let me pop that up and we’ll just move on. So those two things; live bravely and remember others who helped you get here. Adriana Linares: One of my favorite quotes from the Dalai Lama and I won’t get it exactly right but one of his famous quotes is something along the lines of always be kind, it is easy because it is, it’s so easy to just be grateful and be thankful and turn back every once in a while and say, I really appreciate your support. And that goes a lot further than so many other things could ever go. So I think both of those are such great advices. I love be brave. It’s obvious right but again it’s one of those weird things that we forget to think about because we don’t hear it enough. So I really want to thank you Amy for taking the time — well first I’m going to thank you for being brave and going out there and building what sounds like an awesome practice that is only getting bigger and better I am sure of course sharing your experience with New Solo listeners because you know you’re the you now, right. Adriana Linares: So you used to listen to this show and listen to other guests and think wow that’s pretty cool, I got some great advice but that’s you now. Now New Solos are going to listen to the show and completely be inspired by your great story. Amy Cahill: Oh I hope that’s true. 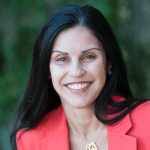 Adriana Linares: My last question is if someone wants to reach out and say hey Amy I listened to your podcast, I just have a question, how do you this, how do you that, how can our listeners either keep an eye on what you’re doing or connect with you or follow you or just look after your success? Amy Cahill: We have a website cahill-ip.com and people are welcome to email me. I love to be a support particularly to women but to anyone. I think women are always looking for a role models or examples of how to keep going with a family and how to make it work and how it is done, sort of change lanes or adapt to new life circumstances and I just don’t want women to give up if they think what they’re doing is important, their professional lives are important, I want to keep going and I want to feel like I’m there to provide them with support for that. So my email address is HYPERLINK “mailto:[email protected]” [email protected] and I’d love to hear from anyone. Adriana Linares: That’s awesome. Amy what are your children’s names? Amy Cahill: Oh you’re so nice to ask. I have three boys and a girl. Adriana Linares: I love names. Amy Cahill: Joseph is the oldest boy, then Harvey is the second boy and Edward who we call Lee is the third boy and then the baby girl is Kathleen and I call her Kate but my husband insists on Kathleen. Adriana Linares: Oh those are wonderful awesome, strong, great names. Adriana Linares: Well thank you so much Amy. For all of our listeners who would like more information about what you’ve heard today make sure you visit New Solo at HYPERLINK “http://www.legaltalknetwork.com” legaltalknetwork.com. Of course you can always follow us on all your favorite podcast and social medical channels and I am Adriana Linares. Thank you for listening and join us next time for another great episode, and remember, you are not alone, you are New Solo. Outro: Thanks for listening to New Solo with host Adriana Linares. 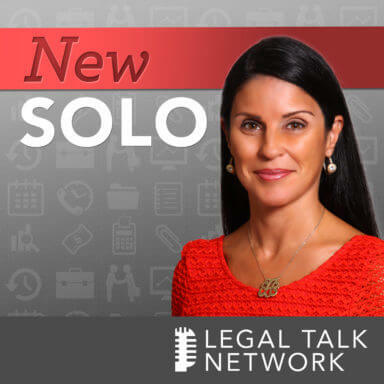 Tune in again to learn more about how to successfully run your new practice, solo, here on Legal Talk Network.